My first official assignment as a Brand Ambassador for California Strawberry Commission was to re-invent the strawberry shortcake. After a brief stop on the idea of another chocolate strawberry shortcake, and possibly a lemon lavender version, I settled on a matcha version, something I hope is new to you all (I like to feel inventive! 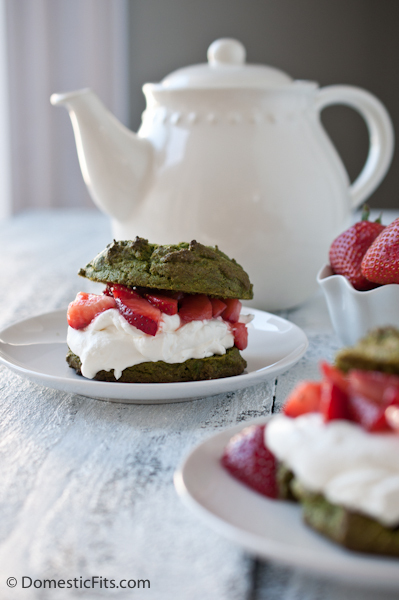 ), and matcha goes so well with strawberries. I’ve had Matcha powder (Japanese green tea powder) in the back of my mind for a while, on my list of foods to bake with. It gives a great contrast of color and flavor to the gorgeous strawberries, if you’re a matcha lover, I think you’ll agree. I also have a pin contest to tell you all about. It’s a great excuse to spend a little extra time on pinterest while checking out some fantastic strawberry recipes, getting inspired for those summer cook-outs and trying to win some extra cash! 1. Follow CA Strawberries on Pinterest and become a fan of California Strawberries on Facebook for contest updates. 2. Create a “CA Strawberry Shortcakes” contest board on your own Pinterest page. 4. 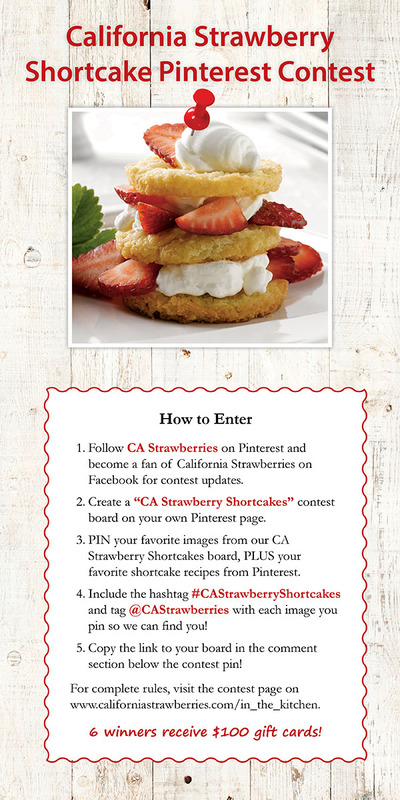 Include the hashtag #CAStrawberryShortcakes and tag @CAStrawberries with each image you pin so we can find you! 5. Copy the link to your board in the comment section below the contest pin, OR on the California Strawberries contest post in the comments section! To give you a little inspiration, check out this awesome strawberry shortcake recipe from Muy Bueno Cookbook and Savory Simple! Add flour, sugar, matcha, baking powder, baking soda and salt to a food processor, pulse to combine. Add the butter cubes, process until the butter is incorporated, about 1 minute. Add the milk, process until just combined. Line a baking sheet with parchment paper. Drop large spoonful’s (about the size of a lime) onto the baking sheet, evenly spaced. Bake at 400 for 15-18 minutes or until the tops have just started to brown, remove from oven and allow to cool. In a large bowl, stir together the strawberries, lime juice and granulated sugar, set aside. Once the shortcakes have cooled, make the whipped cream. In the bowl of a stand mixer beat the cream, powdered sugar and lime zest until soft peaks form. While the mixer is runner, add the lime juice, beat until incorporated. Split the shortcakes and fill with strawberries and whipped cream. *Note: 2 tablespoons of matcha powder will give you a strong green tea flavor and a deeper green color. If you want a more mild, mellow flavor, add only 1 tablespoon. 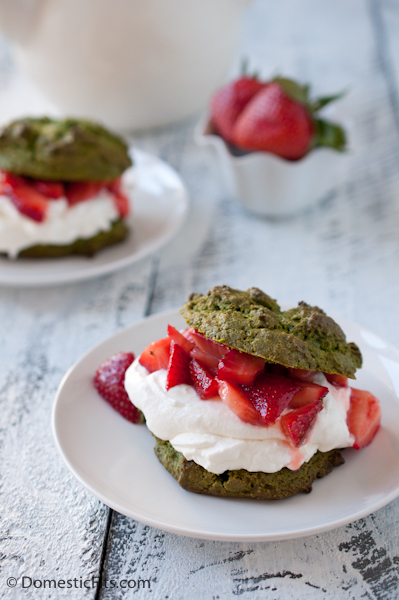 Matcha Strawberry Shortcakes – now that’s not something you see every day around the ‘sphere! So creative, Jackie! 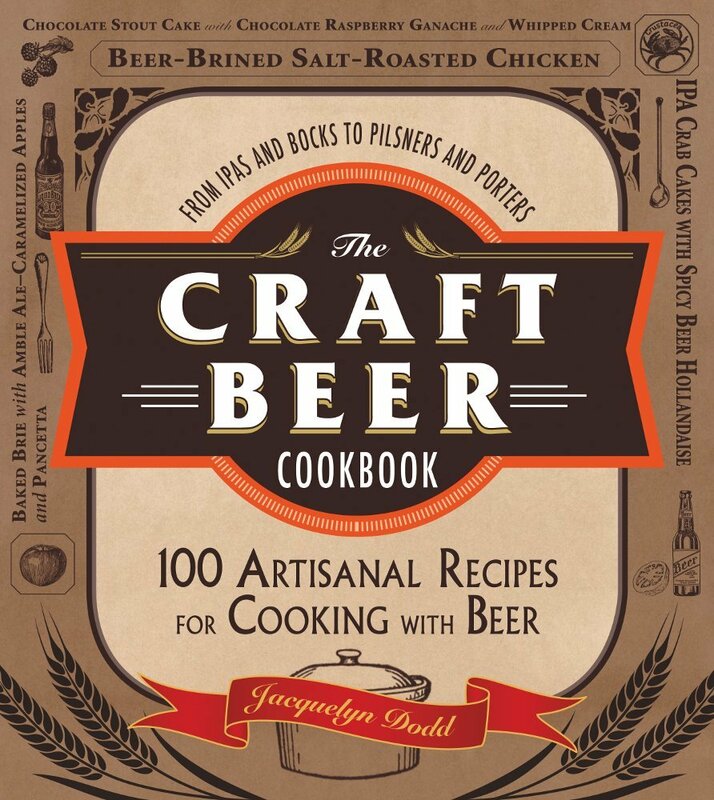 I would love to try them! These are so different and how creative! They look awesome! What a way to reinvent it, too! these are stunning! I love your re-invention! It’s so, so beautiful. Don’t think I’ve ever had strawberry and lime together but now I must! That green against the bright red strawberries is stunning! Oh, so creative! I bet the fragrance is divine! I would love to try these shortcakes! Super creative! Love it! And I love the idea of the lime zest and juice in the whipped cream. Yum! 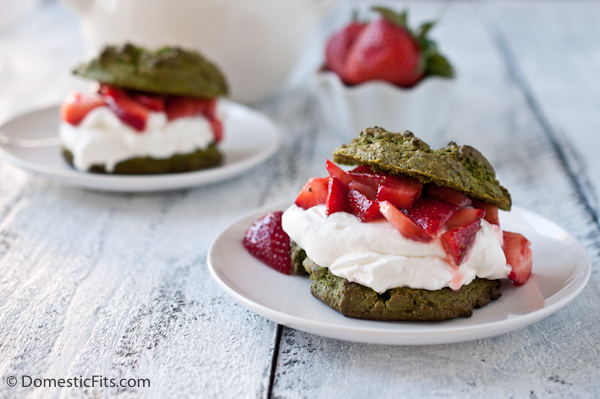 Goodness gracious, girl… these shortcakes… SO genius!!! WOW! I wish I could taste this! yum! I love the way you re-invented strawberry shortcake! Jackie this is out of this world amazing. I cannot even believe this one. I bet it just tastes wonderful. Very creative lady. And the photos are stunning.